Imperial Russia introduced standardised fiscal stamps to signal the payment of judicial (Court) fees in the late 1880s. These stamps, printed in St Petersburg to the usual high standards, were attached to Court documents and normally cancelled and dated, most often in manuscript. Prior to that, many local courts produced "Raffle Ticket" - style stamps (or tickets) to indicate payment of judicial fees. 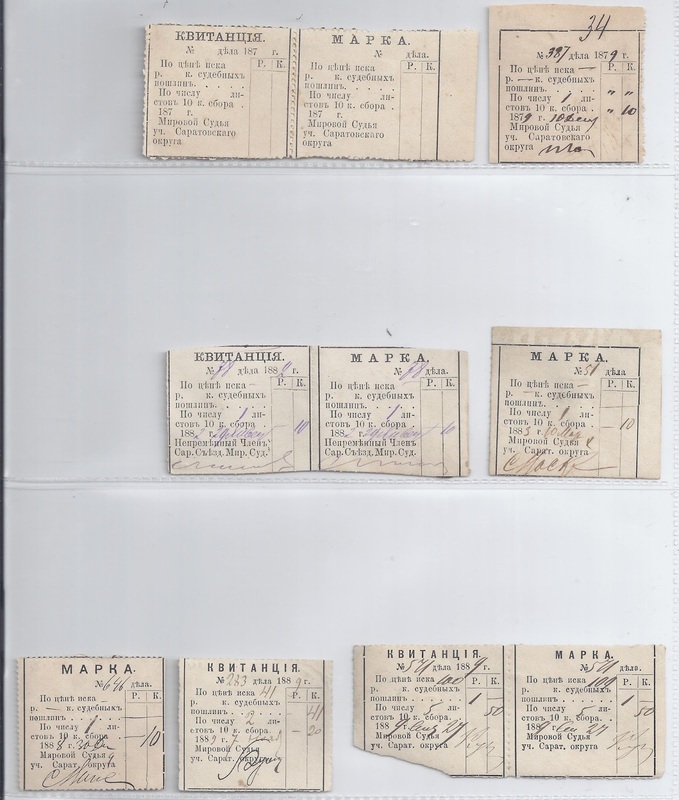 The "MAPKA" (Stamp) right part of the ticket was attached to the document relating to the fee paid and the middle "KVITANTSIA" (Quittance, Receipt) was given to the person paying the fee. The Court did its own financial accounting using a third, left hand part to the Raffle Ticket kept by the court clerk. 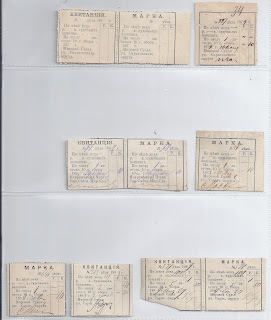 John McMahon on his russianrevenuestamps.com website shows a (unique) complete sheet of tickets from Kamenets-Podolsk laid out in the three columns just described. Anyway, these Court Tickets are collected by Russia Revenue specialists as forerunners of regular judicial fee stamps. They are generally quite scarce and, for some courts, rare. Above I show a selection of items from Saratov. These were in a large Russian fiscal accumulation I recently acquired for my stock. I have removed them from grubby album pages. In the bottom row there are stamps and receipts for 1889, showing that these local Fee tickets continued in use after the supposed general introduction of Court Fiscal stamps in 1887. The unusual presence of three pairs in this group may indicate that the Saratov court was careless about providing receipts. Any other ideas?